Jason Gulledge races a Street Stock on dirt tracks in the Southeast. Like most racers running out of their own pockets, he'd already maxed out the budget on the race car. So when he blew an engine unexpectedly, it was a big hit to his racing program. Gulledge was able to scrape together enough dough to get it repaired, but a second engine failure would be devastating and likely put the season to an early end. So we turned to Innovate Motorsports for a little help to make sure Gulledge can keep the engine properly tuned and happy after many nights of racing. Innovate's new DLG-1 air/fuel ratio gauge can measure the air/fuel ratio in real time and display it on a digital gauge that mounts in the car. Unlike many less-expensive systems, we like that the DLG-1 can read from both banks of cylinders on the engine and let you know how they are doing individually. 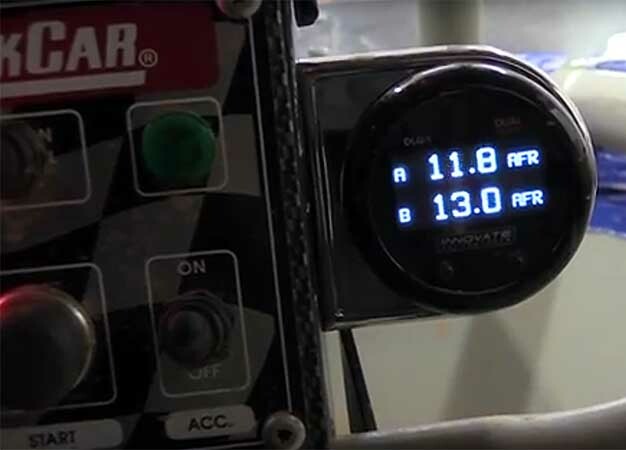 And while we mounted it in an oval-track stock car, the DLG-1 will work in practically any performance car or truck to help you track your air fuel ratios for better tuning with either a carburetor or fuel injection. This video was fun to make because we got the chance to hang out at the race track and even got some pretty interesting in-car footage. Plus, the gauge was an absolute snap to install. For more information, you can check out Innovate Motorsports web page on the DLG-1 here.